Eager to make government work better, cost less, and be more accountable, reformers are embracing a common prescription: consolidate and downsize government agencies to eliminate duplication and overlap. But is this prescription really a panacea for what ails government, or is the solution for better government performance more complex? 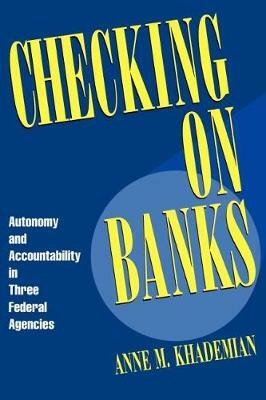 This book tackles that question by examining the three federal agencies responsible for supervising the nation's banks the Federal Reserve Board (the Fed), the Office of the Comptroller of the Currency (OCC), and the Federal Deposit Insurance Corporation (FDIC). The Clinton administration has proposed to consolidate these three agencies into one to improve efficiency and accountability. Anne Khademian argues that downsizing government activities through consolidation does not guarantee better performance. Consolidation implies agreement on the best way to perform a task, but each of the three banking agencies has its own unique and valuable management style and level of autonomy, growing out of the agencies' history and politics. For example, the Fed has a high degree of expertise and autonomy, the OCC is known for innovation, and the FDIC places high priority on examiner training. Khademian maintains that the jurisdictional overlap among the agencies reflects an essential tension between accountability and autonomy. And a new consolidated agency would destroy that tension. Khademian contends that in the rush to consolidate, we might destroy administrative systems that have real benefits or provide important lessons about implementing government programs and risk creating new ""super agencies"" whose systems of accountability and operational autonomy are at odds with expectations for performance. Before we can improve government performance, we need to know why agencies behave the way they do. This book offers a framework for understanding agency behavior. In the case of banking, Khademian argues that the diverse approaches to supervision provide an important balance in the system that has worked to keep U.S. banks among the safest and strongest in the world.